Home » News » How media shaped the EU debate: will it be ‘The Sun Wot Won It’? 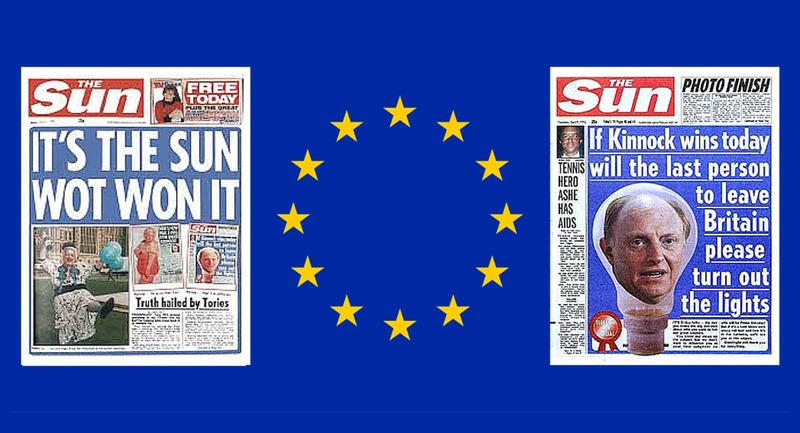 How media shaped the EU debate: will it be ‘The Sun Wot Won It’? With the referendum imminent, many of the country’s most-read national newspapers have shown an increasingly strong bias either in favour of Brexit or ‘remain’. Papers such as The Financial Times and The Guardian are in favour of remaining in the EU whereas The Telegraph and Daily Express are firmly against. And Murdoch’s papers are split, with The Times backing the ‘remain’ campaign, and The Sun championing Brexit. Even sister papers Daily Mail and Mail on Sunday are on opposite sides of the debate. And if the papers’ stance wasn’t quite clear enough, recent headlines certainly hammered their message home. While the split might seem fairly even, research carried out by the Press Gazette suggests that the country’s media are in fact overwhelmingly in favour of Brexit, in terms of their circulation and resulting reach. But will this bias actually affect the referendum result? We’re all aware of the influence media has had in the past. Most notably, The Sun’s famous front page in 1992 – ‘If Kinnock wins today will the last person to leave Britain please turn out the lights’ – which was argued to have won the election for the Conservatives that year. The notorious headline, ‘It’s The Sun Wot Won It’, followed shortly after the election result. But do they carry the same weight they once did? Circulations of UK newspapers have fallen since the days of that famous front page but some would argue that they still have a direct influence on the public, and can even affect other media agendas. Others argue that voters’ minds have already been made up and the country’s media are merely feeding off public opinion. It is clear, however, that the press is still a powerful tool to have on your side in any election or campaign, even if just for the fact that their headlines often set the agenda for discussion and debate amongst voters. And while it remains to be seen whether headlines actually have the power to sway votes, we’re sure we’ll all be waiting on tenterhooks to see the front pages after the result has been announced. Are you looking for advice on media relations? The Tonic Communications can help. Contact us to find out more about our track record.